Our professional lay flat photo albums are of the best quality with unmatched durability and a most exclusive look. The hardcover 3mm thick calendared sheets are printed with cover and a durable surface protector. At first glance, the carefully selected photos and graphics give the suggestion of inner beauty to our hand made luxury wedding albums. The cover with foil leather print is an example of not only aesthetic, but of the provided protection from scratch, abrasion, and UV radiation. The prints inside are water resistant. This pearly photo paper is treated with a special coating that enhances the brightness of the color and light effects of the photos. First of all, there is no reason to have your high-quality photos stored on a DVD, resting on a shelf or in a drawer not being enjoyed. They can be your real tangible experiences made into a personalized photo album or premium quality photo book. We deliver hand made luxury wedding albums, professional lay-flat photo books. The different techniques we can use in these tasteful albums are fine “brush strokes,” many different design graphics. 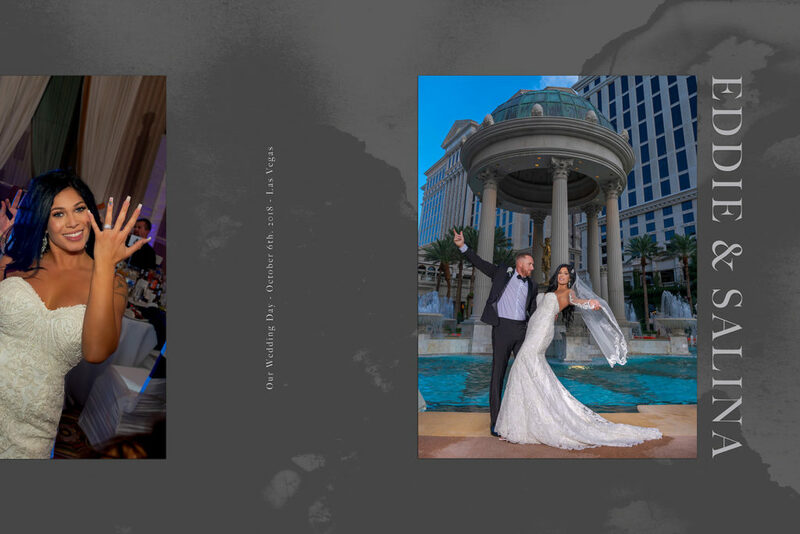 Furthermore, simple lines and shadows for a dramatic effect will make your Fine Art Wedding album stand out. Another notable feature of our Fine Art Galleries is the substrate mounted on high quality, heavy duty paper with photographs printed on double pages that can be opened fully to a 180-degree plane. These albums are available in 20, 24, 30, 40, and maximum 80-page with thick lay flat pages versions to accommodate your every life moment or affair. Edina and Miki … The Vegas surprise!